Within the last 6-8 months a local long time (since 1977 at least) hang gliding site was shut down by a group of local citizens with no governmental authority. Kind of odd how this kind of thing can happen. Unfortunately, ignorance and bias seems to be at the heart of this matter. I'd like to look at the relatively new Mossy Bank Park rules ( as posted online here - http://mossybankpark.com/about.php ). below, the launching of any aircraft, including drones and hang-gliders, is prohibited from Mossy Bank Park. While there is a nesting/mating pair of bald eagles in the valley north of the park, the launch is approx. 450 feet above and 1,250 horizontal feet away from the nest. However, that 1,250' is in a straight line to a point directly over the nest. The true distance to the nest is equal to the hypotenuse of a triangle with side A = 450', side B = 1250'. Doing the math involving A^2 + B^2 = C^2 results in the distance to the nest being 1,329 feet. Interestingly, Google Earth defines the "ground length" distance as being even further at 1,352.3 feet between the nesting tree and the HG launch site in Mossy Bank Park. Why is any of this important? Well, New York State's Eagle Management Guidelines describe that "helicopters and fix wing aircraft" must stay a quarter mile away from an active bald eagle nest. Sadly it seems that certain individuals making the rules for the park have a problem with measuring distance. A quarter mile = 1320 feet. The launch is just beyond that distance, which means that any hang glider launching from that point in the park is doing so without violating ANY of NYS's Eagle Management Guidelines. Let's consider the language used by the individuals involved with making the Mossy Bank Park rules. It should be noted that they are implicitly defaming hang glider pilots (and PG pilots?) by stating that our flight activities, in some undefined way, threaten our local bald eagles. In doing so, these (rule making and publishing) individuals are defaming ALL hang glider pilots. Any reasonable person reading the park rules can easily assume that hang glider pilots (anywhere?) threaten living examples of our national symbol. That's both wrong and inexcusable. And it is also damaging and defamatory to participants in our sport. I've also flown cooperatively with what was either an osprey or a peregrine falcon many years ago above Harris Hill near Elmira, NY. He/she hung out only about 10-20 feet off my wing tip and followed along in the ridge lift. The whole event didn't last much more than 30 seconds to a minute, but it was an amazing experience just the same. I'm wondering if any of the rest of you have had any positive experiences flying with either bald (or golden) eagles - or other large raptors - at your local sites? If so, I'd like the opportunity to share these with my local park rule makers. * This claim would, of course, exclude some intentionally aggressive act made by some bird hating (?) HG pilot. Does such a HG pilot even exist? PS - I have experienced and witnessed aggressive acts by raptors while flying HGs. Both cases involved a red tail hawk that felt it needed to protect its territory along the (lower) secondary ridge in Ellenville, NY. Because of those events I KNOW what the type of things a large raptor may do to show aggression. I would also like to make note of the added comments at the bottom of Mossy Bank's park Rules. 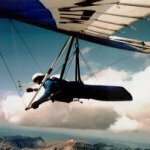 [Hang gliding, among other activities, require] a Letter of Request to be submitted to the Village Clerk and approval by the Bath Village Board of Trustees and proof of insurance in an amount set by the Bath Village Board of Trustees and naming the Village of Bath as an additional insured. This is odd since in New York State we have a Recreational Land Use Statute that holds the land owner (i.e., the Village of Bath, NY) harmless connected with liability issues associated with a number of outdoor activities, including hang gliding (which is named specifically within the law). b. an owner, lessee or occupant of premises who gives permission to another to pursue any such activities upon such premises does not thereby (1) extend any assurance that the premises are safe for such purpose, or (2) constitute the person to whom permission is granted an invitee to whom a duty of care is owed, or (3) assume responsibility for or incur liability for any injury to person or property caused by any act of persons to whom the permission is granted. c. an owner, lessee or occupant of a farm, as defined in section six hundred seventy-one of the labor law, whether or not posted as provided in section 11-2111 of the environmental conservation law, owes no duty to keep such farm safe for entry or use by a person who enters or remains in or upon such farm without consent or privilege, or to give warning of any hazardous condition or use of or structure or activity on such farm to persons so entering or remaining. This shall not be interpreted, or construed, as a limit on liability for acts of gross negligence in addition to those other acts referred to in subdivision two of this section. c. for injury caused, by acts of persons to whom permission to pursue any of the activities enumerated in this section was granted, to other persons as to whom the person granting permission, or the owner, lessee or occupant of the premises, owed a duty to keep the premises safe or to warn of danger. 3. Nothing in this section creates a duty of care or ground of liability for injury to person or property. I think you should address this with the Village of Bath as soon as possible. The longer it sits on the "back burner" the harder it will be to fix.